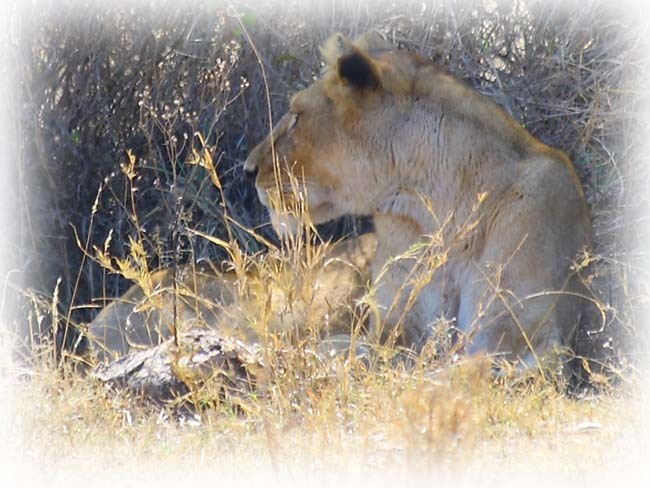 The lioness had been hunting whole day long but found no food. The gazelles were too fast. The buffalos were too strong. Long ago, she had a family and three baby cubs. She cared for them so much. Only one starry night, a lone lioness came and swallowed all her cubs alive. She killed the intruder, but all was too late, only the bones were left. A family without children is a family without future. One by one, her companions died, in fight or in hunger. She was now all alone, wandering in the savannah, deserted by the sinking sun. When night finally came, the starry sky revealed, like it once did when her cubs were murdered. She roared at the dome of night, for all her injustice and sorrow. Her roar shook through the heaven, reaching the Milky Way beyond. One little star was shaken loose by the powerful roar and fell from the Milky Way. It crossed the night sky in a brilliant arc and landed squarely in front of the lioness. The lioness swiftly caught the unlucky star between her paws and opened her blood thirsty mouth. "Please don't hurt me," begged the fallen star, shedding droplets of lime color tears, "if you let me go, I shall grant you one wish." "I want justice," roared the lioness, "I want food." "Food and justice you will have," said the little star in a trembling voice, "a mile north from here, beneath a hill with a dead tree, you shall get what you seek." The lioness released the little star and let it rose slowly back to heaven. She then followed the instruction and travelled north. Beneath a hill with a dead tree, she found what she sought. A family of lions were sound asleep under the starry night. A few yards away from their mother, three baby cubs lied cuddling together. They looked so defenceless, and so delicious.